The Combo-Flo™ valves draw NO electrical current. These lightweight valves are operated pneumatically via compressed air or CO2. The Combo-Flo™ consumes very little volume of CO2/Air, and you may "T" into the pressure supply you may already have for air shifters, etc. 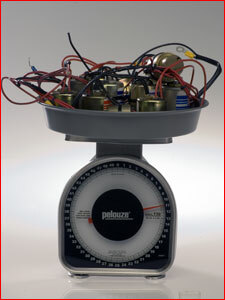 The Model AV- actuator used in the Combo-Flo™, (patent pending) systems use only 0.6 amps. Our tests on a conventional four system nitrous setup (double nozzle with double plate systems, six electric nitrous and six electric fuel solenoids) show an electrical consumption of nearly 60 amps at 16 volts. The same system using Combo-Flo™ valves consumes only 2.5 amps. In our experiments we were able to operate an entire multi-delivery nitrous/fuel system with a 9VDC transistor radio battery! With less electrical output consumed by your nitrous/fuel system more electrical power is available for your ignition system! 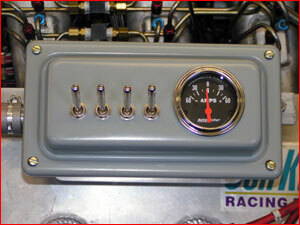 3 systems of nitrous using conventional solenoid valves draw 60 amps. These solenoids will weigh over 11 pounds and require nearly 100’ of electrical wire!